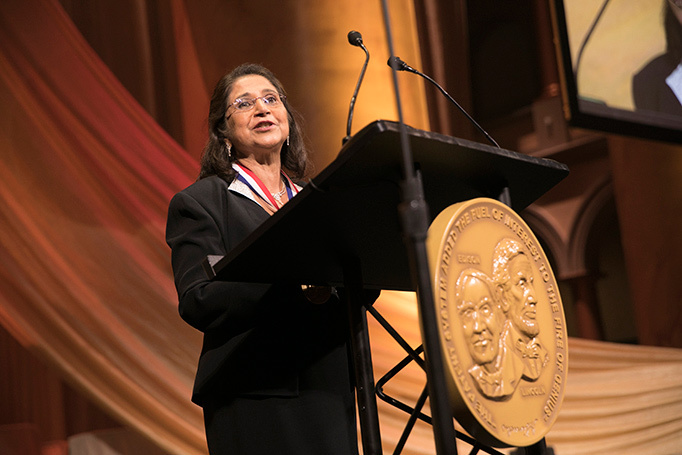 2018 National Inventors Hall of Fame inductee for Nanocomposite Dental Materials, Sumita Mitra, accepts her award, and thanks the many people she says helped her along the way. Photo courtesy of NIHF. Innovation is alive and well in 2018. How do I know? 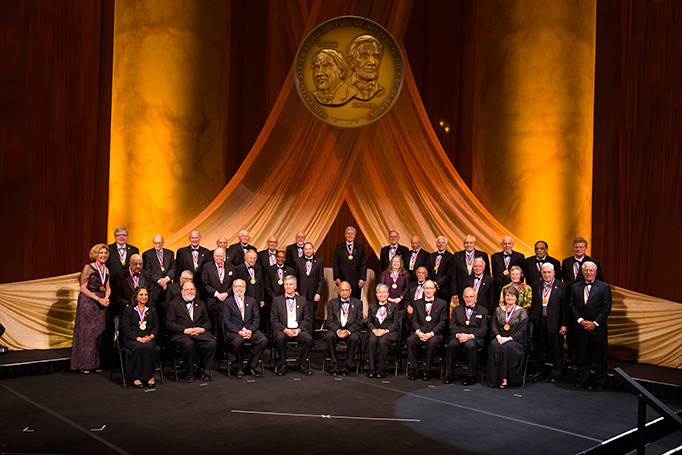 On May 3, I had the honor of helping induct 15 of America’s greatest innovators into the 46th class of the National Inventors Hall of Fame (NIHF). The historic National Building Museum in Washington, D.C., echoing with memories of America’s greatest thought and political leaders, was a fitting backdrop for the momentous event. The personal stories of these visionary men and women encouraged everyone present to keep dreaming of a better tomorrow. By the end of the evening we had inducted 10 living inventors, named another five posthumously, and raised thousands of dollars for Camp Invention – NIHF’s nonprofit elementary enrichment program that is building the next generation of inventors, innovators, and entrepreneurs like 8-year-old Mighty Minds contest winner Nikaya Baranwal. I’ve spoken before about the power of a childlike wonder for discovery and invention. Camp Invention spreads and nurtures that wonder in children today, especially in underserved communities, so that they can be the innovators of tomorrow. 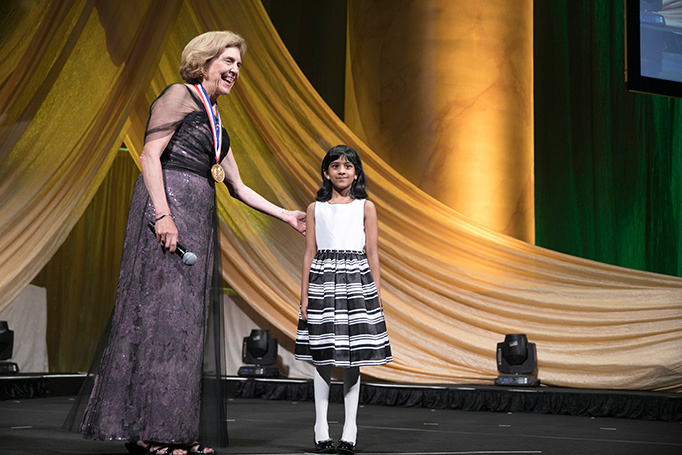 2017 NIHF inductee Frances Ligler discusses the excitement of invention with 2018 Camp Invention Mighty Minds winner Nikaya Baranwal of Clifton Park, New York. Photo courtesy of NIHF. 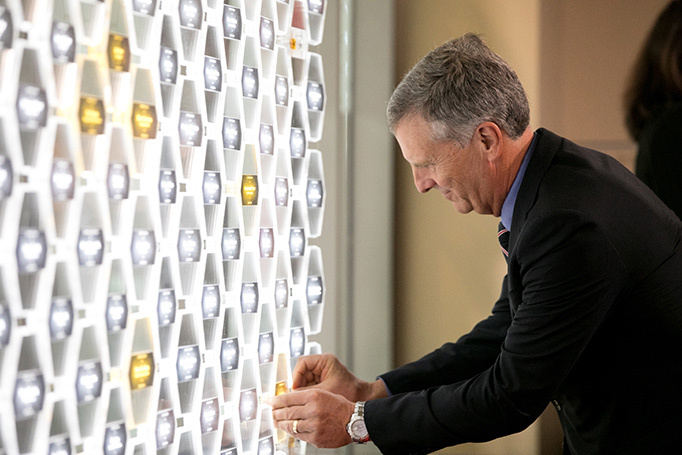 The induction ceremony on May 3 was part of a series of events honoring both the new and previous inductees, which kicked off with an illumination ceremony on May 2 at the National Inventors Hall of Fame Museum on the USPTO campus in Alexandria, Virginia. If you haven’t been to the NIHF museum, I encourage you to make a visit part of your summer plans; I guarantee you’ll be inspired. 2018 NIHF inductee for Sports Broadcast Graphics Enhancements, Stan Honey, illuminates his name in the Gallery of Icons at the 2018 illumination ceremony at the NIHF museum in Alexandria, Virginia. Photo by Jay Premack/USPTO. During the illumination ceremony, each inductee places their name into a beautifully lit hexagonal icon. The shape of the icons is deliberate – a structure based on hexagons grows stronger with each new addition just as each of the inductees have added to the economic and social strength of our nation. And each one adds their light to the bright beacon of invention. The 2018 inductees were not the only stars at the museum last week. In recognition of their important work, the patent examiners of record on NIHF inductee patents attended the ceremony. Each went home with a certificate of appreciation from the USPTO and NIHF, and an opportunity to meet the grateful inventors behind the hall of fame patent they examined. As I’ve said before, across our desks, and through our doors, comes the future. I cannot overstate how essential our patent examiners are to the innovation ecosystem. All National Inventors Hall of Fame inductees present at the 2018 induction were recognized on stage with the newest class of inventors to share the prestigious title. Photo courtesy of NIHF. Collectively, this year’s inductees have used IP protection to create more than 16 startups, some of which have grown into leading American companies in fields from biotechnology to wireless communications. They have dramatically changed things from the way we watch sports and communicate to the way we eat food and care for the environment. Their vision has manifested into thousands of jobs and countless improvements to our very way of life. We are forever grateful for the contributions of all National Inventors Hall of Fame inductees, and I know I am not alone when I say we look forward to seeing what the future brings. Learn more and watch a video on the inspiring work of all the inductees. This page is owned by Service Desk.